Like a number of independent/freelance composers, my music is usually all performed with virtual instruments and samples. Most of my experiences with music writing have involved either writing for live instruments, with music notation software like Sibelius and Finale, or by using virtual instruments in programs like Garage Band or Logic Pro. A number of pieces that I wrote back in college were recorded, but the actual recording process was always handled by someone else. It was something that was considered a separate discipline from music composition and only a few of my peers actually went out of their way to learn some of the basics. To this day I’m not entirely sure why we weren’t all actively encouraged if not required to study it by our professors and instructors. It’s something that I regret not pursuing as much, in hindsight. For most of the past year, I’ve remained focused on learning more about the mixing and arranging process for music production. As much as I’ve wanted to incorporate live instruments into my pieces, I decided that learning the different plug-ins and interfaces for Logic Pro needed to take priority. There’s no point in getting audio uploaded into the interface if you don’t know how to edit and process it. I wanted to make sure that I had a good understanding of my DAW (digital audio workstation) before adding recording equipment into the equation. After gaining some experience producing tracks on Logic, I decided to finally start looking into acquiring some recording equipment. I began doing research on the different types of microphones and what would work best for my home studio. Specifically I needed something that I could use for recording a variety of different sound sources. I needed good entry-level microphone that would be good for recording vocals, guitar, and my studio piano. The type of microphone that was recommended by most people was a condenser microphone. There’s a good selection of brands to choose from, and I could find a decent condenser microphone for around or below $100. 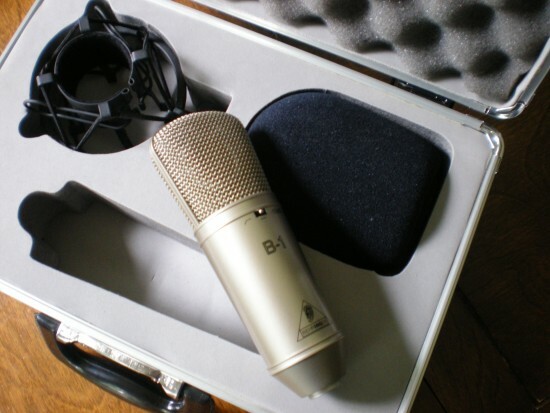 A few microphone models that were recommended to me were the Samson C01, the Behringer B1, and the Audio Technica AT2020. These three became my focus for researching opinions, technical specifications, and reviews. After talking to some people and debating with myself on which one to get, I finally settled on the Behringer B1. Most of the reviews I read on it were very positive. Even people who thought that it was lacking in some aspects stated that it was a great microphone when compared to other mics in the same price range. Many people reported that it has a very flat EQ response, as advertised, meaning the recordings would be very accurate to the original sound source. The primary criticism that I heard about the microphones, and Behringer products in general, was that they borrow the designs of better mics and keep costs down by manufacturing them in China. Despite this, a majority of people seemed to be pleased with the microphones and many people with their own studios recommended it as a good entry-level microphone, which is exactly what I was looking for. 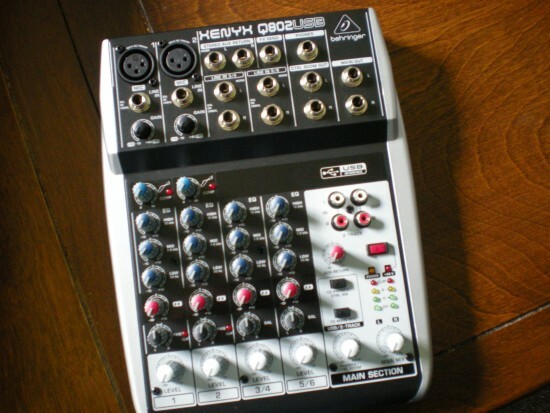 I ended up ordering the Behringer B1 as well as a small audio mixer, the Xynyx Q802USB. The mixer was needed in order to supply the microphone with 48 volts of power and to transfer the recorded data to the computer via the mixer’s USB interface. Both the microphone and the mixer arrived in about a week. The Behringer B1 came with its own carrying case along with a shock mount and a windscreen. The case is fairly low-grade and lightweight, made of aluminum and plastic, so I don’t think I’ll be using it for traveling anytime soon. It looks like it will work fine for storing the equipment when I’m not using it. The shock mount is well-built and has some padding on the inner ring to protect the mic from getting scratched. The microphone itself has a sturdy nickel-plated brass body and has a heavy solid feel to it. Overall a very well constructed look and design. The Behringer mixer, much like the carrying case, is very lightweight. A lot of lightweight metal and plastic went into the construction of this mixer, which had me a little worried. For the low price I paid I wasn’t expecting much, but I was still a little skeptical. Once I read through the instruction manuals for the mixer and the mic, I set them up for a test run. I kept the setup fairly simple. I connected the mixer to my computer through the USB cable, plugged in some headphones into the mixer to monitor the sound, and attached the B1 to the first mixer channel. After some minor fiddling with the gain and channel levels, I got a consistent and clear response from the mic. Everything that the mic picked up sounded almost exactly like the original source. The one big thing that I noticed was that the mic was picking up just about every sound that was in its range, no matter how subtle. Hopefully this won’t provide to many problems for actual recording sessions. I may need to do some more soundproofing for the room in the worst case scenario. Everything on the mixer worked very well. My only minor concern is that the mixer did get a little hot after my testing session, but it seemed to cool down relatively quickly. I’m hoping that it won’t cause any problems in the future or during any lengthy recording sessions. I’ll probably do some other tests with my guitar and external effects at a later date, but for now it looks like I’ve got my new recording studio setup. I’ll need to spend more time with the devices before I can truly give a final verdict or endorsement, but it looks like they’ve been a good investment so far. Both the Behringer B1 and the mixer work great and I can’t wait to start doing some more recording and experimenting with them.